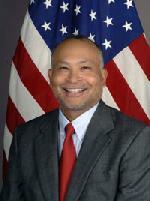 Alexander A. Arvizu is a career member of the Senior Foreign Service, rank of Minister Counselor. Alexander joined the Foreign Service in 1981 and has served in several assignments domestically and abroad related to U.S. foreign policy in East Asia and the Pacific. His overseas tours include Phnom Penh, Cambodia, where he was Deputy Chief of Mission, as well as Seoul, Korea and Osaka-Kobe, Japan. In Washington, Alexander was Director for Asian Affairs at the National Security Council during part of the Second Clinton Administration, prior to which he was Deputy Director in the Office of Japanese Affairs in the Department of State. In 2003-04, Alexander was a member of the 46th Senior Seminar, a U.S. Government-wide Executive Leadership Program. He also worked as a staff officer in the Department of State's Executive Secretariat earlier in his career. Alexander was born on a U.S. Army base in Japan and grew up in Colorado. He earned a bachelor's degree from Georgetown University in 1980. Over the years Alexander has studied several Asian languages, including Japanese, Korean, Thai and Khmer.